O’Donnellan & Joyce auctioneers is back with its final auction in the Wild Atlantic Way auction series for 2017. With strong sales results from the November auction and following a successful year in the auction room, O’Donnellan & Joyce has launched its Wild Atlantic Way Christmas property auction, the final auction of the year set for Thursday, December 14, in the Harbour Hotel, New Dock Road, Galway. O’Donnellan & Joyce auctioneers are the largest live auction house in Ireland and has more than 40 properties going under the hammer on December 14. Open viewings are under way all along the Wild Atlantic Way up to the auction day in Galway, Mayo, Roscommon, Leitrim, Clare, Offaly, Cork, Sligo, Longford, and Louth. Colm O’Donnellan of O’Donnellan & Joyce said: “We have a variety to choose from in Galway city and county giving excellent value for home owners and investors interested in becoming property owners in the west. There is something for everyone in this auction." The properties available to view for the December auction sale include the following. Exceptional four bed detached property located in one of the most desirable residential areas of Galway city. Situated just off Taylor's Hill, Maunsells Road is a distinguished address, well serviced by nearby amenities and local transport links allowing easy access to the city centre and other Galway locations. Ideally located close to several quality schools, both primary and secondary, it is also within close proximity of Salthill, NUIG, UHG, and walking distance to Galway city's West End. AMV: €425,000. Open viewings Wednesdays and Saturdays 11am to 12 noon. Single storey, three bedroom cottage style residence situated in an idyllic rural location, but with plenty of neighbours close by. Only 2km from the quaint village of Clarinbridge with its bars, restaurants, and contemporary boutiques. Oranmore town is only eight minutes' drive away with primary and secondary schools and a train link to Dublin. Would make a lovely starter home. AMV: €200,000. Open viewings Wednesdays and Saturdays 11am to 12 noon. Delightful three bedroom semidetached family home, conveniently located within 2km of NUIG, UHG, and Galway city centre. Local amenities include Westside Shopping Centre, primary and secondary schools, and recreational facilities at Westside playing fields. An ideal owner occupier residence or alternatively a gilt edged investment due to its exceptional location. AMV: €175,000. Open viewings Wednesdays and Saturdays 1pm to 2pm. Detached four bed bungalow is just a short stroll to Oughterard village centre and only two minutes' walk to St Paul’s Secondary School and the local national school. Galway city centre is just 30 minutes' drive away. With a large lawn to the front, and a garage to the side, this property would make an ideal starter home. AMV: €100,000. Open viewings Wednesdays and Saturdays 2.30pm to 3.30pm. A listed building situated in Ros Geal, a residential estate of semidetached homes within easy access of NUIG, UHG, and Galway city centre. This is a high profile listed building referred to as Rahoon House. Previous planning permission reference 07/825 for four two bedroom apartments. AMV: €80,000. Details on application. Enjoying stunning views of the Salt Lake, Weir Bridge, and Errisbeg Mountain, this four bed mid-terrace house is 10 minutes' walk from Clifden town. On an elevated site, it enjoys a southerly aspect and with little passing traffic, this house is perfect for a family home or would make a quiet holiday getaway. Joint agent is Matt O’Sullivan, Clifden. AMV: €125,000. Open viewings Saturdays 11am to 12 noon. Clifden is known as the ‘Capital of Connemara’ and attracts tourists all year long. O’Donnellan & Joyce are delighted to bring to the market these two terraced houses in the town centre. For sale in one lot, accommodation of each property comprises living/kitchen/dining with open fireplace on the ground floor, one bedroom and a bathroom on the first floor, and another room on the second floor. There is off road parking to the front and a small garden at the rear. AMV: €150,000. Open viewings Saturdays 12.30pm to 1.30pm. Investment property – tenants not affected. Located in the heart of Barna village and adjacent to The Twelve Hotel, this modern building fronts the main street and enjoys an excellent profile. Barna is a popular residential village offering plenty of excellent amenities and is located approximately 7km west of Galway city centre. This is an excellent opportunity for an investor to acquire a fine commercial property of approximately 900sq ft.
AMV: €120,000. Viewings by appointment. Investment property – tenants not affected. Excellent investment opportunity to acquire a commercial unit of approximately 86.4sq .m. Currently let on a five year lease with annual rental of €12,000. AMV: €130,000. Viewings by appointment. Investment property – tenants not affected. This is an excellent investment opportunity to acquire a commercial unit of approximately 84.6sq m. Currently let on a 25 year lease since May 2008 with annual rental of €17,000. AMV: €175,000. Viewings by appointment. Investment opportunity to acquire large commercial premises on Main Street Rear in Kiltimagh, Co Mayo. Situated opposite SuperValu, the property is arranged over two storeys and is approximately 184.26sq m.
AMV: €20,000. Open viewings Saturdays 2pm to 3pm. This building houses a number of premises. Border, Midland, and Western Regional Assembly offices: Ground and first floor office and conference centre let on a 25 year lease from 2001 at €85,310 per annum. Currently renting at €79,228 per annum. JP Bookmakers: Ground floor retail unit let on a 21 year lease from January 1 2006 at €20,000 per annum. Post office building: Retail unit extending to 1,060sq ft approximately. Let at €12,000 per annum on a five year lease. Former convenience store: Vacant retail unit extending to 1,060sq ft approximately, together with two apartments overhead on the first floor. AMV: €570,000. Viewings by appointment only. Linnane’s, Main Street, Ballaghadereen, Co Roscommon. Mid-terrace property of approximately 1381sq ft, the building comprises a former residential dwelling, as well as a retail unit on the ground floor. AMV: €40,000. Viewings by appointment. Two-storey building offers approximately 2,206sq ft of space in the centre of the town of Ballaghadereen. Former bar/restaurant ideally situated in the centre of Headford village, only 25 minutes from Galway city and 15 minutes from Ballinrobe. Downstairs features the restaurant and pub with toilets, kitchen, and storage rooms. Upstairs has three bedrooms, a bathroom, and a sitting room, access is through the pub. The public house licence has expired. AMV: €110,000. Open viewing Saturdays 11am to 11.45am. Semidetached three bed house for sale with a front yard and a communal yard to the rear. Situated in an ideal location in the town of Headford. Close to all amenities and only 26km from Galway city. AMV: €95,000. Open viewings Saturdays 12 noon to 12.30pm. Corner retail unit with two commercial retails shops, one currently occupied by Print Shop and being sold with the tenant in place while the other is vacant. Rental income €700 per month. Tenant in place 11 years. Both units have the benefit of overhead accommodation, which are currently vacant and in need of refurbishment; each has separate off street access. AMV: €110,000. Viewing by appointment. Beautiful four bedroom home close to the town of Dunmore. Being sold with tenant in place, this superb family home offers spacious living and sleeping accommodation. The property is currently rented and will be sold with tenant unaffected. Rental income €500 per month. AMV: €135,000. Open viewing Saturday December 2 2pm to 2.30pm. Retail unit of approximately 1,000sq ft in the centre of Kilkerrin village. AMV: €30,000. Viewing by appointment. Detached four bedroom family home in Hazel Court, a small estate in a quiet cul de sac just off the N17 Tuam Galway road. This charming property represents all that is good about the north Galway residential market at the moment. This property is the ideal modern family residence and viewing is highly recommended. AMV: €180,000. Open viewings Saturdays 1pm to 1.30pm. Land of approximately 107 acres for sale with a derelict house and ruin, a large hay barn, and also featuring a 15 acre plantation of (hardwood ) five-year-old ash and alder trees with approximately 10 acres generating an annual premium of approximately €4,000 per acre. Good road frontage with easy access. Folio GY85032F. Detached bungalow sitting on a 0.65 acre site with spacious gardens to front and rear. The property has four bedrooms, with master en suite. Attic is converted to storage area. A spacious property in need of slight modernisation, this would be a fantastic family home at a very attractive price. AMV: €65,000. Viewing by appointment. Three bed ground floor townhouse in Clifden Station House complex, built over three floors comprising an entrance hall, living room, and kitchen on the first floor, with two bedrooms and a bathroom on the second floor and an en suite bedroom on the top floor. Double glazed windows and electric storage heating. All amenities are on the doorstep. Three bedroom detached bungalow on an elevated site of circa 0.54 acre. The property extends to approximately 71.9sq m including an entrance hallway, kitchen/dining room, living room, and bathroom. Being sold with vacant possession and offers beautiful views of the surrounding countryside. Folio LD14579F. AMV: €75,000. Viewings by appointment. Beautiful two bedroom apartment situated in a select development in a stunning harbourside location with panoramic private balcony views of Newport Quay and River Estuary and access to the Great Western Greenway. AMV: €110,000. Open viewings Saturday 11am to 11.30am. Market Court is a high quality infill development, comprising a five storey block together with multi-storey car park to the rear. Apartment 202 has electric storage heating and is accessed by a lift. Market Court is strategically located, on the junction of Cornmarket Row and High Street, approximately 100 metres north of William Street and opposite the Milk Market. This is an exceptional location and is within walking distance of all of Limerick city centre amenities. Management fee is €750 per annum. AMV: €70,000. Open viewings Sundays 4pm to 5pm. Beautiful three bedroom, two bathroom detached house extending to approximately 1,600sq ft on an elevated site with panoramic views of Lough Bofin and the River Shannon. No 1 Cnoc Bofin, which is being sold with vacant possession, features solar panels and is presented in pristine condition throughout. The property overlooks a private marina and would be an ideal family home or holiday residence. AMV: €160,000. Open viewings Saturdays 1pm to 2pm. Four bed detached dormer bungalow sold with vacant possession. On an elevated site of circa 0.5 acre. Situated in a rural location only 5km from Foxford and 25 minutes from Ireland West Airport Knock. AMV: €80,000. Open viewings Saturdays 12.30pm to 1.15pm. Workshop and derelict house on 17 acres located in the rural area of Moanmore. Folio CE23353. AMV: €80,000. Viewing by appointment. Circa 35 acres of agricultural land with Folio numbers MY65823F and MY3252. The lands are of reasonable quality and are located within close proximity of Ireland West Airport Knock. Two bedroom apartment with off street access and communal parking to the rear. Situated within walking distance of the busy town centre of Ennis. Strolling distance to Ennis rail and bus station. AMV: €70,000. Open viewings Saturdays 11am to 11.30am. Detached five bedroom bungalow situated on a large site of approximately 0.7 acre with a large front garden and detached shed to the rear. Property would require refurbishment throughout. Located only 10km from Ennis and 2km from the village of Quin. All amenities are within 5km of the property. This property has the potential to provide an excellent family home . AMV: €135,000. Open viewings Saturday 1pm to 2pm. Three bedroom end of terrace house with a large rear garden and shed. Situated in the village of Ballinlough, close to Ballyhaunis and Castlerea, the property requires refurbishment throughout but has the potential to provide an ideal starter home. AMV: €20,000. Open viewings Saturdays 11am to 11.45am. Circa 0.6 acre site located on the Clara Road, Tullamore. Contains no planning permission. Folio OY19187. 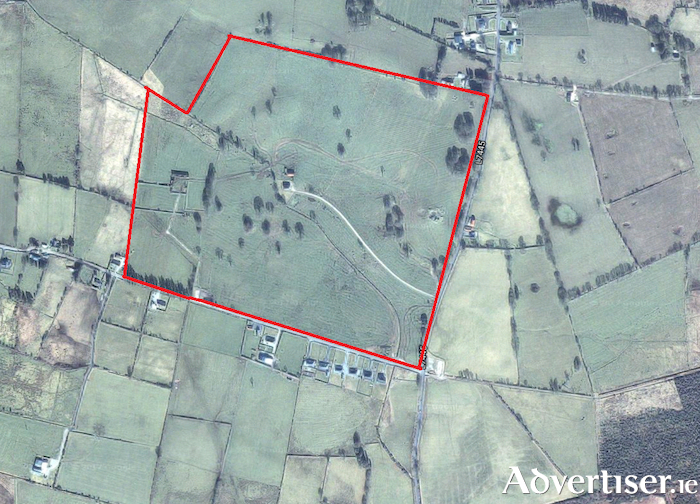 Folios SL5973F and SL4925F, five acres of land on the Mayo/Sligo border, for sale as one lot. Originally built in 2005, this building is in need of refurbishment throughout and comprises 16 apartments consisting of two, three, and four bedroom accommodation, all with bathrooms, kitchens, and living areas. Within five minutes’ walk of Letterkenny Institute of Technology, this block offers an excellent opportunity for development potential with the potential of lucrative returns. AMV: €300,000. Viewing times to be confirmed. For further information on these or any of the properties for sale, contact Colm O’Donnellan, Mary Fahy, or Anne Harding at O’Donnellan & Joyce auctioneers, 5 Mary Street, Galway, on 091 564 212, www.odonnjoyce.com, or email [email protected] . Page generated in 0.1497 seconds.